The wonderful thing about Ikebana is the boundless of materials we can use. However, it has often been misunderstood with it being labeled as “Japanese Floral Art”. Many ikebana works have NO flowers at all. Like those by the great Ikebana Master – Tetsunori Kawana. His huge installations of bamboo outdoor sculptures are made entirely with just bamboo! This is the beauty of ikebana. We are not bounded by just flowers. But all natural materials (and sometimes with unnatural ones as well) can be used. I made this display with broccoli, tomatoes and the stems of some wilted Spanish Iris I collected when I was pruning in the garden. The broccoli works well as a kenzan. And surprising the stems of the Spanish Iris are strong like thin branches. You might ask, “What? You use broccoli and tomatoes and wilted flowers stems for a display?” Yes, and it was a challenge but the process was fun. There is a lot of “things” in our fridge we can use- mainly the fruits and vegetables. Capsicums are great as small containers with dramatic colours while peas (whole before pealed) can be wired to add into a bouquet! Fruits like apples, oranges and lemons are great too. And don’t just limit yourself to flowers/ foliage that purchased from shops. Look around your garden and at your park? The fallen piece of braches along the footpath might have very interesting bends and shapes! 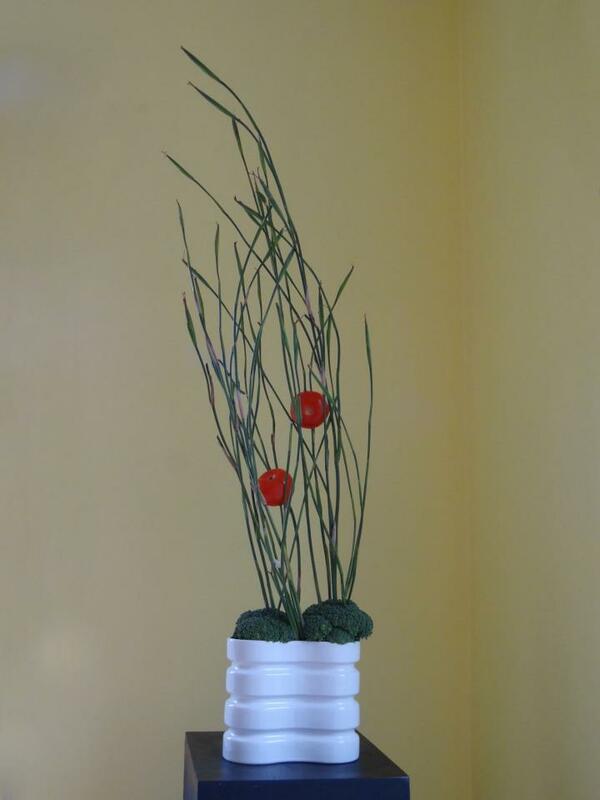 Here you go, you don’t need flowers to make ikebana- just look around, especially in your fridge!